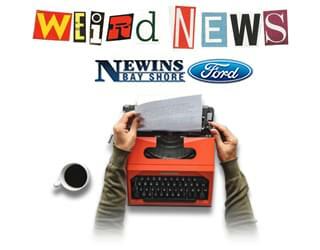 Home » Blog Index » Featured, Jim Douglas Mornings, Weird News » The mayor is a goat! Literally! The mayor is a goat! Literally! NBC claims a three-year-old goat is set to become the mayor of Fair Haven, Vermont. ”Lincoln’ was chosen by residents to be the city’s first honorary pet mayor. A gerbil, named Crystal, was also in the running to lead the city. This might be a lesson to read the small print. Florida travel insurance company Squaremouth, says Georgria high school teacher Donelane Andrews has been awarded $10,000 for reading the fine print in a policy she recently purchased. The company launched the secret contest on February 11th, and buried in the fine print was the promise of $10,000 for the first person to send an email to a specific address. Michael J. Weirsky, of Alpha, New Jersey, was feeling down…couldn’t find a job, just got divorced. He even left a lottery ticket he had just purchased at the store where he bought it. He went back to get it, and luckily, someone had given it to the guy behind the counter. The clerk gave him the ticket…he wins $273 million.